After years of speculation -- and months of digging in their basement -- a family unearths what they think are the long-lost remains of a family patriarch who disappeared 57 years ago. Greg Cergol reports on the deepening mystery from Lake Grove, Long Island. 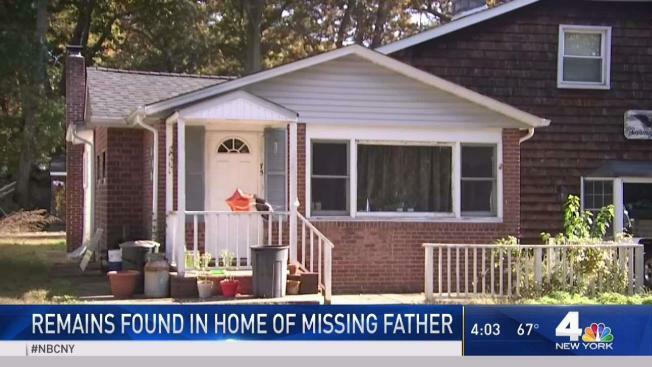 A son of a Long Island man who vanished in 1961, leaving his wife and children alone to grapple with the mystery of his disappearance for decades, says he feels relieved by the discovery of bones in the same home this Halloween. "We felt abandoned as kids but he was here the whole time," Steven Carroll, who was just 5 when his father George disappeared, told News 4 Thursday. Steven Carroll and his brother Michael stumbled upon a skeleton in their basement Wednesday; bones they believe belong to their long missing father. Steven Carroll says his mother told him and his siblings very little about what had happened until just before her death in 1998. The family never filed any missing persons report and there is "no record" of police involvements in his disappearance, Suffolk County police say. He and his siblings all have different theories about their father's disappearance, Carroll said, though he declined to share some of the differences in speculation. Though they never knew what happened to their father, police say that for reasons that remain unclear the family had always thought he might be buried in the home he lived in on Olive Street in Lake Grove. That home is now owned by Michael Carroll, Steven's brother. And it was that bizarre hunch that prompted the next generation -- George Carroll's grandsons -- to start digging in the basement. It was an excavation project that tooks months -- and they hit the remains, which sat below concrete, on the spookiest day of the year. Police say a DNA test will need to be performed to confirm the body in the basement is George Carroll, but they suspect foul play in the death of whoever was found in that cellar after so many years. The family believes it is George Carroll for sure. If that turns out to be the case, his sons want to give their father, a Korean War veteran, a proper burial at Calverton National Cemetery, Steven Carroll said.